Dear ER Nurse Gretchen— Thanks. I got a chance to talk with Bruce on the phone just before you emailed. He said you gave him some good drugs to kill the pain from his bike accident this morning. Here’s the story. I was waiting on the Solano (south) side of Old Railroad Bike Bridge while Bruce rode into Winters to find a bathroom. We were going to extend our usual Davis to Winters and back ride by making a loop around Lake Solano. I hadn’t been waiting 5 minutes when a women I didn’t know with a dog on a leash came into view screaming and waving her arms from the Winters’ (north) side of bridge, “Clay, Clay come, Clay come quick!! !” I rode over the bridge to the north side and she said your friend is on the ground by the Winters Senior Center. Bruce’s wheels had slipped while making a slow speed right turn on damp/slick pavement and he’d fallen. When I found Bruce he was prostrate on the ground and groaning with pain and unable to sit up or even lift his head much. “Yes,” he said weakly but without equivocation. I called 911 and they asked me some questions, which I answered—breathing yes, no bleeding, no head injury apparent, the victim is 65. They asked me to stay on the line. Shortly, a type I Winters fire engine, red lights flashing and siren blaring, showed up with four firefighters with emergency medical gear. They checked Bruce out pretty carefully then splinted his ankle with cardboard and dressed his skinned knee. It was misting, so once they figured-out it safe to move him, a Winters firefighter the size of Hoss Cartwright picked Bruce up like he was a small child and carried him over and set him on a bench under the eves of the Winters Senior Center. Sorry that I didn’t get a picture of that. It was a sight. It reminded me of a sculpture by Michelangelo. Bruce asked me, and I said “yes” and kept all second thoughts to myself. (Sometimes I can be a cheapskate, even when it’s not my money.) Of course, we didn’t know at that time he had a broken leg and that it was important he keep his leg straight. Bruce must have a high threshold for pain, enough so that I think he might have been having second thoughts about the ambulance, too. In hindsight, the ambulance was a good choice. As Bruce was being loaded into the ambulance, one of the EMTs asked which hospital he wanted to go to? Bruce said, ‘Sutter” and then mused “I wonder what the chances are that I’ll be treated by Gretchen?” Gretchen is a head nurse at Sutter Davis Hospital and a very active Davis Sunrise Rotarian. No Rotarian relishes the embarrassment of showing up in Gretchen’s ER. The ambulance crew chuckled, closed the rear doors of the ambulance and took-off for Sutter Davis ER. I went over to Steady Eddy’s for a coffee and to warm up before riding back to Davis. Bruce’s incident was already the subject of wild speculation among the locals who’d been peering out the coffee house windows at all the flashing lights, half a block away in the morning mist. I did run into Myke Berna (owner of Velo City, the bike shop in Winters) at Steady Eddy’s and filled him in on what happened. So at least one person in Winters has the straight scoop. Mike said that handicap ramp from the sidewalk down to the level of the Rotary Park parking lot was not intended for bikes, but bike riders use it a lot to get to and from their cars and to get to the bathrooms in the park. It has proved to be a hazard and the city and others interested in bike safety have been looking into improving bike safety at this location. Thanks, Gretchen for taking good care of my biking buddy Bruce. Here’s to Bruce’s speedy recovery. Bruce’s emailed answer to Brooke’s important question: “No bathroom, just a jar in the ER. And, no, Gretchen didn’t watch.” The good news is that given time to rest and recuperate, Bruce will heal-up just fine. There is always next season. 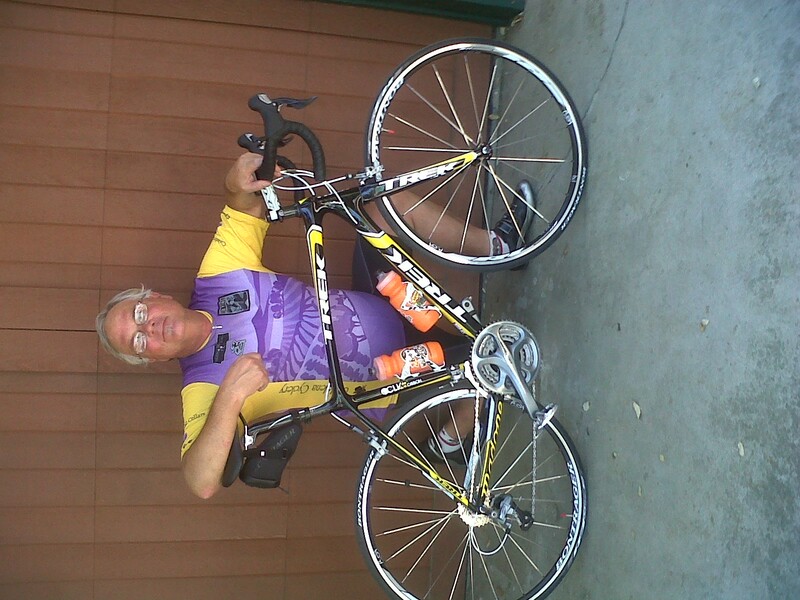 This entry was posted in Biking, Retirement, Rotary and tagged Biking, Winters. Bookmark the permalink. I had the same question that Brooke had! I’m so glad she asked and that you posted the answer! Here is sympathy to Bruce is all regards. It’s a funny story, but I dont know if it’s OK to laugh! Glad he is OK! It’s OK to laugh. Bruce is still laughing. He asked for ride to Rotary, and did quite well at the meeting. Bruce is still getting around on crutches and has been instructed to start putting a little weight on his right leg. Wow, Clay, I didn’t know about this blog…nor did I hear from Bruce (no surprise here) all the details of this long-ago accident. I’m just surprised you didn’t race the ambulance back to Sutter to make sure Gretchen didn’t molest our fallen Rotarian!